Check out Forza 2 on the XBox 360. That allows custom paint jobs that you build up by resizing and positioning stencils so that only a small amount of information as to be transmitted for each car. It sounds too simple to work, but some of the cars made are just amazing. If a console can do it then an MMO can. Thanks Jon, will definitely check it out! I would like this too HOWEVER I want it to be done when you build the ships. This would allow say Gobldy Goo corp to put their tags on the ship then sell it in Jita for all to buy. You could have people special order ships from you and if you are really good at moding them your work would be known all over. As a member of Phoenix Labs, a manufacturing corp, I'd love to see PPL-branded ships flying out there. That would indeed be sweet! ROFL... the game can barely handle 40 people in the same area. I can only imagine how bad this will be with 40 custom hoopties all playing tag. EVE, fix your UI and give us the revelations promises already. Stop tempting us with crap that will never see the light of day. Tempting crap that'll never see the light of day? Where the hell have you been the last 12 months Heartless? So far Revelations (aka Kali) has been rolling out a steady stream of improvements and new features; just as they'd promised. CCP's got my vote of confidence. I'll agree that they've 'tempted' us with atmospheric flight, avatars walking in stations and other juicy promises, but these things take time. You've got to give them some slack. I've seen a few good ship skins like this. I just have to ask, is that an actual model of a Kestrel or just a 3-d CG? 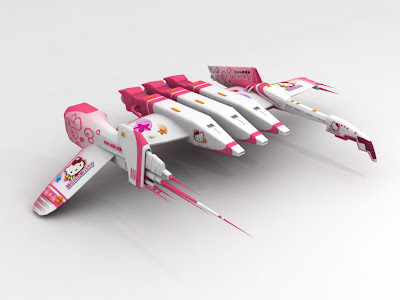 anyhoo, I recently found a hello kitty Apoc. I can't say I'd mind flying something like that. and no, it's gotten so much better with combat. I've been in 50+ person fleets with no lag, even in battles with another 50+ person fleet. if you set your options right, I don't see why everyone can't do it. my connection is still a G+ so it isn't as if I'm running on N power. opens up a possible in game market for decals and skins though. something to look at. This could be done if you made it an option to download the custom skin the person made. Basiclly right-click "load custom skin"
DONE! That way you dont have to load everyones but say just your corps, or your friends.